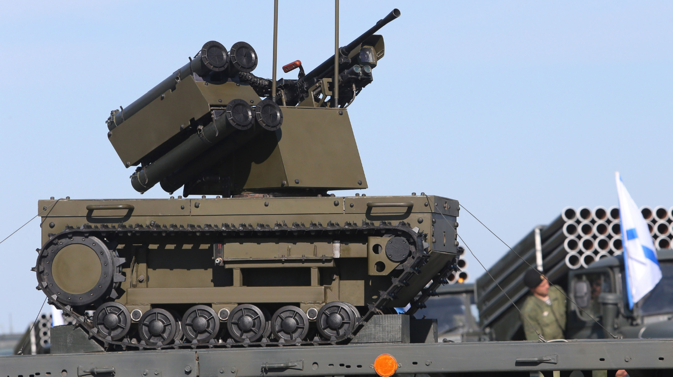 Russia is continuing development work on a range of innovative automated machines to optimize the performance of its armed forces in the field. The army is successfully using a whole range of machines and some technical models are being tested. Platform-M is the latest robotic combat system, created to fight without entering into contact with the opponent. Its creators say the system is a universal combat unit, capable of carrying out reconnaissance and patrol missions, as well as guarding important sites. Thanks to its weaponry, Platform-M can also be used as gun support. Its aiming mechanism works automatically, without human assistance. Platform-M may be a miniature robot but it is a fierce one: It is armed with a grenade launcher and a machine gun. "The little one" has already proven itself during drills in Kaliningrad last summer and is now being introduced to the armed forces. The Wolf-2 is another "universal soldier" whose military objectives are the same as those of Platform-M. However, Wolf-2 is more powerful and heavier (it weighs a ton, while Platform-M weighs 1,750 lbs). The Wolf has an off-road tracked chassis; therefore going over rough terrain does not affect its speed. The machine does not have a crew - it is controlled via radio from a distance of three miles. During tests it fearlessly crossed spring mudslides. Equipped with Kalashnikov machine guns and large-caliber Utes and Kord machine guns, the Wolf can fire while moving at a speed of 22 mph in any weather and at any time of day. An imager, a laser rangefinder and a gyrostabilizer help its firing precision and it is protected by a layer of special armor. The machine is still being tested, yet the army has already found a place for it: The Wolf will be used in the Strategic Missile Forces as a guard for the Topol-M and Yars missile systems. The Uran-6 is a multifunctional demining system that can do the work of 20 sappers. It can carry out its task from afar: The operator controls Uran at a safe distance of up to 0.6 miles. The machine, equipped with bulldozer blades and trawls, moves across the dangerous terrain, searches for mines and unexploded ordnance and neutralizes them on the operator's command. With its technical characteristics, the Uran-6 can neutralize an explosive object with a potential of 130 lbs of TNT equivalent. However, the robot is still not fully trusted and is followed by sappers who verify how efficiently the Uran-6 has cleared the zone. According to the creators' design, the machine is supposed to neutralize 98 percent of the area it traverses. The Uran-6 is currently being tested in Chechnya, in the mountain ranges of the Vedensky Region. The terrain is very difficult and if the Uran-6 proves itself, it will go into production. Essentially, the Shooter ('Strelets') is nothing but a machine gun fixed atop a tracked chassis. However, this machine is a real commando helper. Thanks to its small size and lightness (it weighs only half a ton), the Shooter can be used for storming buildings in dense urban areas, thereby helping to avoid military casualties. The machine is rather slow-moving: It has the speed of a human being (2.5 mph). Yet the robot can ascend staircases, and during urban warfare or a counterterrorist operation it is irreplaceable. The Shooter made its debut at a military exhibition in the town of Nizhny Tagil in September 2013. However, its future remains undecided. The underwater Gnom robot does not carry any weapons and has the odd form of a video camera. The Gnom is controlled by an operator with the help of a joystick. Underwater the robot searches for and neutralizes dangerous objects such as mines. It is equipped with an omnidirectional locator and sees at a distance of 110 yards. This feature helps the robot perform search and rescue tasks, as well as underwater reconnaissance missions. It weighs only 24 lbs and its dimensions permit Gnom to be carried as hand luggage. The underwater robot was tested in 2005 in the Baltic and since then has been serving in the Russian Navy.